I received a lovely gift from my friend Charlotte, who’s just returned from a week in Barcelona. Knowing my interest in all things gastronomic, she selected several Catalan cheeses and sausages to bring me. 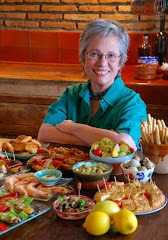 So, coincidentally, I am featuring the food of Cataluña for the second week in a row. But, no politics this time! Clockwise from top left: Garrotxa goat's milk cheese; Formatge Neu, bull blanc, a type of butifarra sausage, butifarra de huevo, a pork and egg sausage, and, in the center, mató, a soft, creamy cheese. Hazelnuts also come from Cataluña. 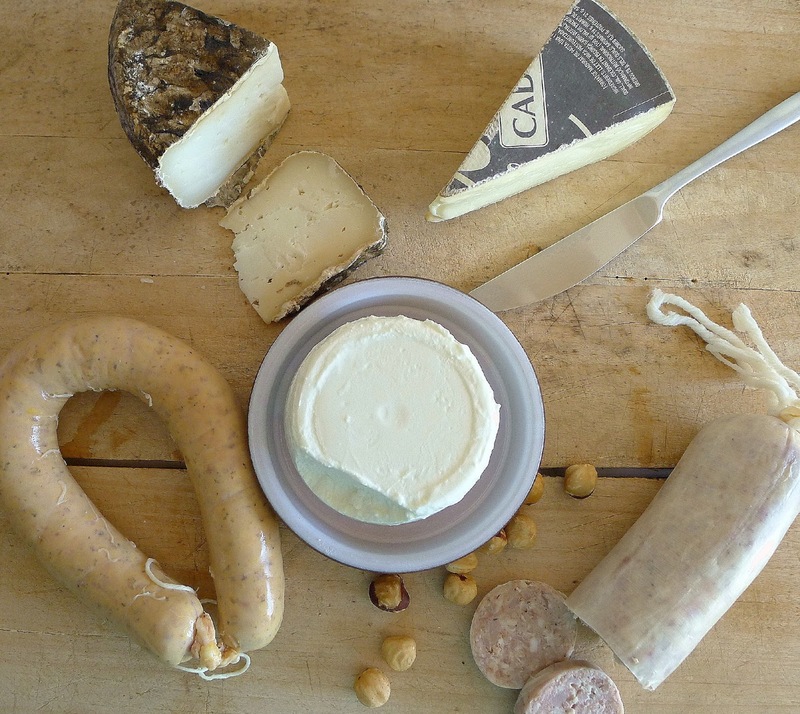 There are three cheeses, Garrotxa, a goat’s milk cheese; Formatge Neu, a soft cow’s milk cheese, and mató, a creamy fresh cheese, and two types of sausage, botifarra d’ou or butifarra de huevo, and bull blanc. Both are cooked pork sausages that can be consumed without additional cooking, though they are best grilled. 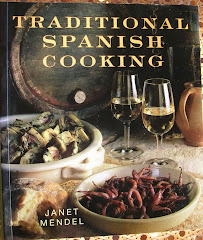 (A must alongside fire-roasted calçots, green onions.) The bull blanc differs from regular white butifarra in that it is stuffed in a larger casing, while the one with eggs has a yellowish color. Catalan sausages can be found in shops everywhere in Spain. However, the cheeses are not so widely distributed. 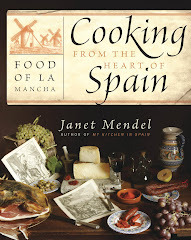 Artisanal cheese making in Cataluña had almost disappeared until the early 1980s, when back-to-the-farm "hippies" began experimenting with traditional methods. Both the Garrotxa and Neu date from that renaissance. Garrotxa (a town north of Barcelona in Girona province) is firm, creamy, nutty (hazelnut) with a slight tang. Ripened for two months, the cheese forms a grey mold on the rind. The cheese is delicious on its own, with wine, diced into salad, grilled, melted. 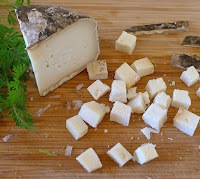 The Neu is soft, somewhat like Brie, and has a white mold rind. 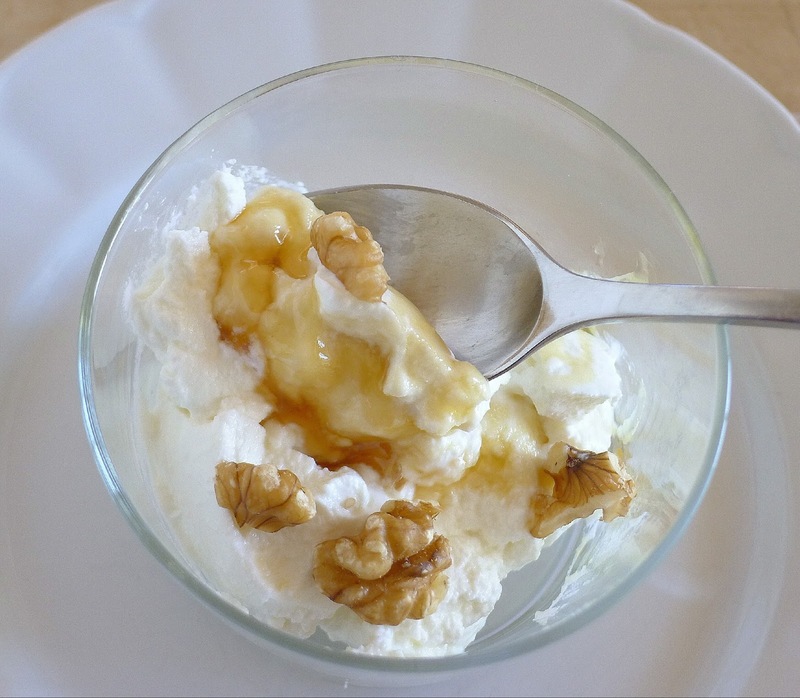 The mató is like solid whipped cream. An unsalted fresh cheese, it is usually served as dessert. Here are some of the dishes I made using these ingredients. Coca--a flatbread with toppings. 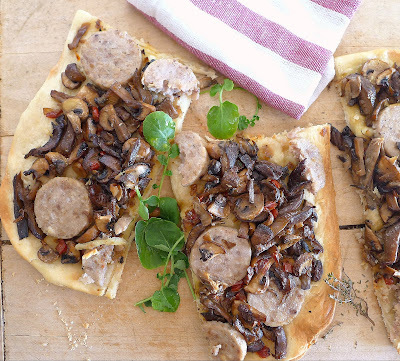 This one has sautéed onions and three kinds of mushrooms and sliced bull blanc, a version of butifarra sausage. 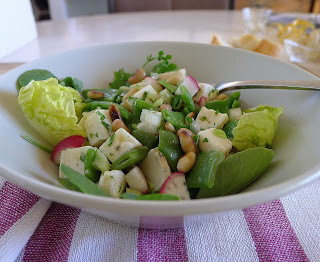 Salad with black-eyed peas, green beans and diced Garrotxa cheese. 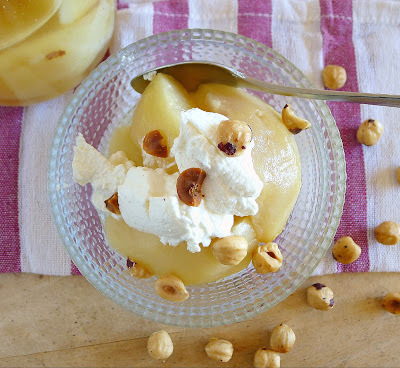 Spiced pears in cava with mató fresh cheese and hazelnuts. Make it a meal or call it a snack, flatbread with mushroom and sausage topping is sure to be a hit. Unlike pizza, coca doesn't have melted cheese on it. Serve it hot out of the oven or room temperature. The coca (plural is coques in Catalan or cocas in Spanish) is sort of a cross between pizza and focaccia. Made from bread dough, the coca is usually served room temperature, rather than hot from the oven. Barcelona bake shops sell it in huge slabs or in tiny, individual coques. Unlike pizza, coca rarely has cheese. The toppings can be a simple as a few strips of red pepper and olives or as replete as the coca de recapte, provisioned with “everything in the cupboard”. 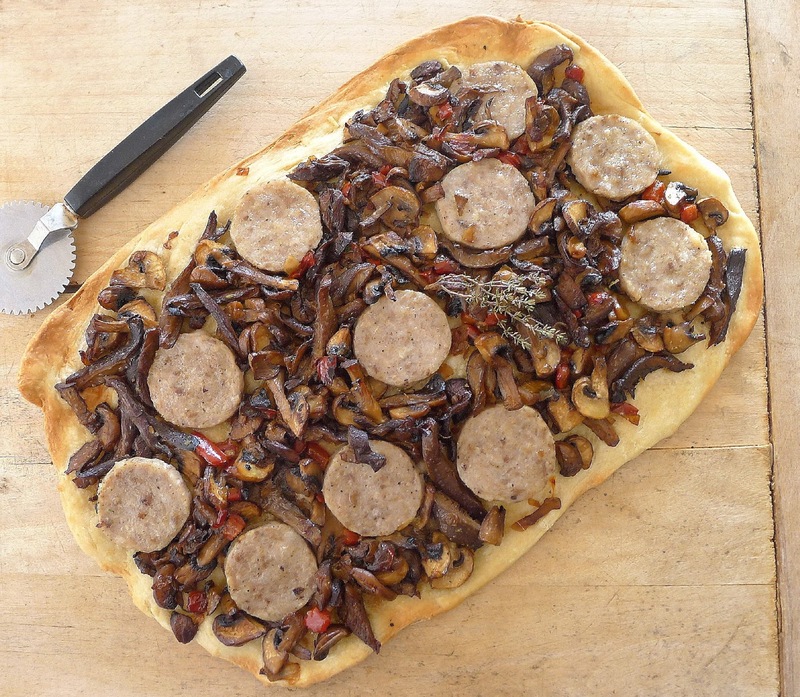 Sliced butifarra sausage is a traditional addition. Use two or more varieties of mushrooms for the topping of this coca, wild ones if they are available. Some give off a lot of moisture, so take longer cooking than ordinary white mushrooms. I used white mushrooms, portobellos and oyster. 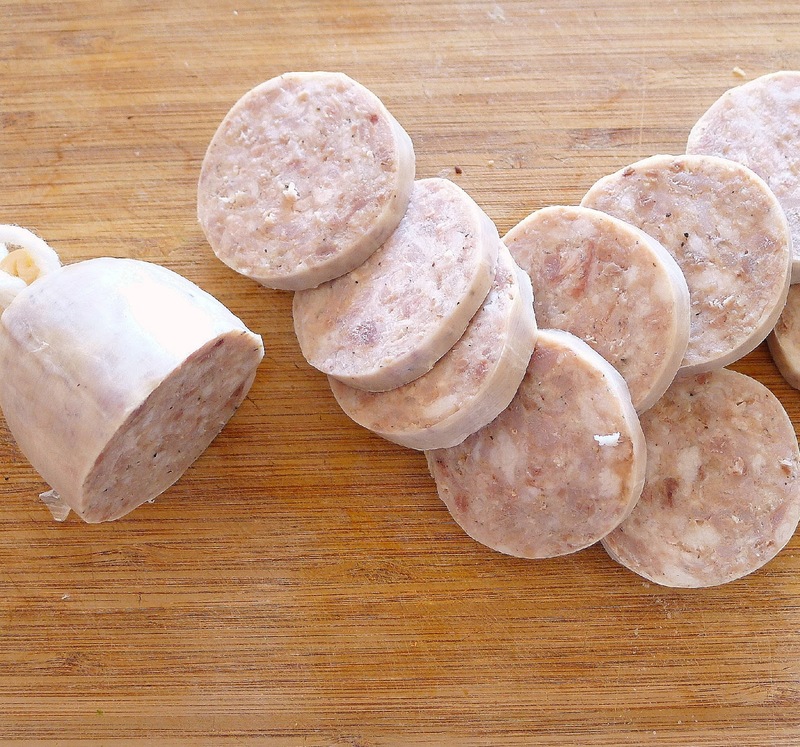 Bull blanc is a cooked pork sausage. Any type of butifarra sausage works. I used the bull blanc. Roll or press out dough to make a rough rectangle (about 14 X 9 inches). Place on a lightly oiled sheet pan. Heat the oil in a skillet and sauté the onion slowly until it begins to brown, about 10 minutes. Add the red pepper, garlic and mushrooms and sauté until mushrooms are cooked, 10 minutes. Season with salt, pepper and thyme. 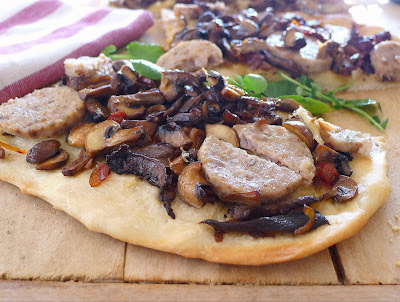 Spread the onion-mushroom mixture on top of the pizza dough. Tuck the slices of sausage into the topping. Bake until the edges of the dough are browned, 20 to 25 minutes. 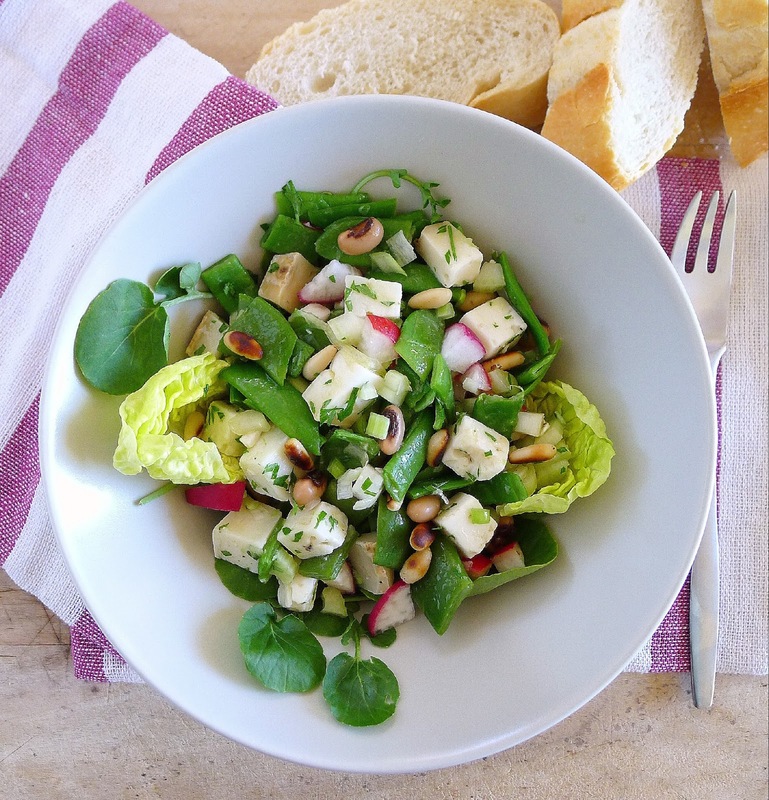 If possible, use a Catalan Arbequina variety olive oil to dress this salad. In a bowl combine the black-eyed peas, beans, radish, celery, scallions and cheese. Season with salt and pepper. Add parsley, oil, and vinegar. Serve the salad with salad greens. Top with pine nuts. Classic way to serve mató fresh cheese--with honey and walnuts. 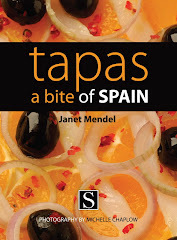 Place a dollop of mató fresh cheese on a plate, bowl or in a glass. Top with a spoonful of honey. Add walnuts. 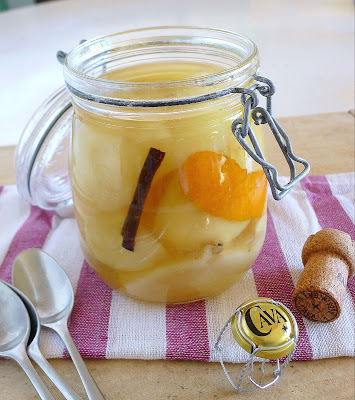 Pears spiced with cinnamon and cardomom are cooked in cava (sparkling wine). Cava is sparkling wine made by the traditional Champenoise method. Cataluña is not the only region where cava is produced, but it is the most extensive. The Catalan grape varieties, Macabeo, Parellada and Xarel•lo, give this bubbly a lovely flowery scent that combines nicely with sweet spices and fruit. 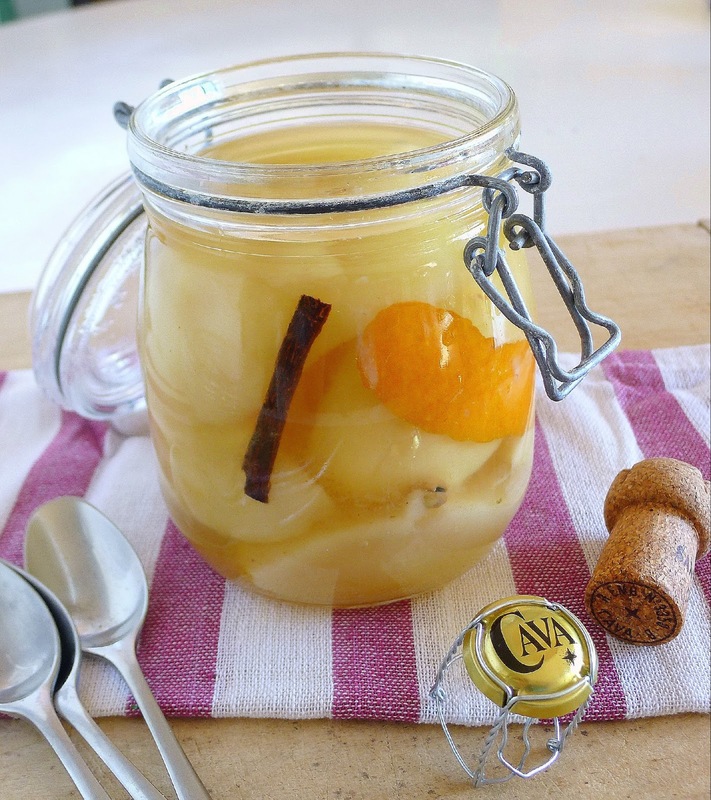 These poached pears can be made with “flat” cava, as the bubbles will cook away in any case. If you use a semi-seco cava, you will not need to add additional sugar. Use white wine if cava is not available. Cook pears until they are soft, but not falling apart, anywhere from 5 to 15 minutes. Peel and core the pears. Cut them in quarters or sixths, depending on their size. Place in a bowl and sprinkle with lemon juice. Place the cava in a pan with the zest, cinnamon, cardamom and sugar. Bring to a boil, then let the syrup bubble 5 minutes. Add the pears and cook until they can be easily pierced with a skewer. Remove the pears with a slotted spoon. Cook the remaining syrup 5 minutes more. Let it cool before pouring over the pears. Serve the pears with the mató fresh cheese and sprinkled with hazelnuts. Catalan Flatbreads with Two Toppings (Coques). 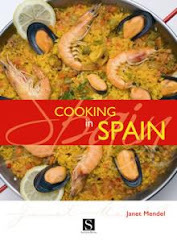 Thank You, Catalan,Richest Food in Spain ! 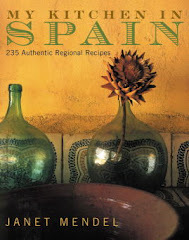 Lovely, I m Catalan and I think you really did a nice dishes with this ingredients! aaamsss: Thank you. I'm glad, as a Catalan, you approve.